Above, from left to right: Side, Dome, and part of the Parish of San Francisco de Asís, The monumental flag, Parish of San Juan Bautista, Statue of Francisco de Asís in front of the parish and Panoramic from the flagstick in the Hill the Tehuehue. Iguala (Spanish pronunciation: [iˈɣwala]), known officially as Iguala de la Independencia, is a historic city located 102 km (63 mi) from the state capital of Chilpancingo, in the Mexican state of Guerrero in southwestern Mexico. 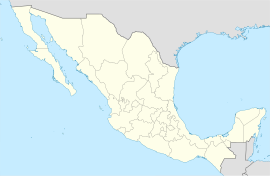 The city of Iguala stands on Federal Highway 95 about 130 km (81 mi) SSW of Mexico City. Iguala is the municipal seat of the Municipality of Iguala de la Independencia, located in the north-central part of the state. The city had a 2005 census population of 110,390 and the municipality 128,444. The area of the municipality is 567.1 km2 (219.0 sq mi). The city is the third-largest community in Guerrero, after Acapulco and Chilpancingo. General Vicente Guerrero was the first military leader to swear allegiance to the Mexican flag in Acatempan, on March 12, 1821. On February 24, the Plan de Iguala had been signed by Agustín de Iturbide and Vicente Guerrero, ending the long Mexican War of Independence. Gaining independence from Spain was represented by the first national flag, known as the Flag of the Three Guarantees, which was made by José Magdaleno Ocampo. Thus, Iguala is called the birthplace of the Flag of Mexico. On 26 September 2014, 43 students from the Raúl Isidro Burgos Rural Teachers' College in Ayotzinapa were kidnapped, disappeared, and likely murdered, provoking ongoing national protests and international attention. Mexican Federal Police and Iguala's police department and former mayor have been implicated in the students' kidnapping and disappearance; members of the Guerreros Unidos drug cartel in the mass murder. The governor of Guerrero state, Ángel Aguirre Rivero, resigned amid the scandal. The San Francisco Church (Iglesia de San Francisco) is a landmark in the city, built in the 19th century in the Neoclassical style. It is surrounded by Tamarind trees, and for them Iguala is known as "la Ciudad Tamarindera" (the Tamarindo city). The Lagoon of Tuxpan (Laguna de Tuxpan), is a lake in the city known for its beauty. Street scene with the San Francisco Church. The Iguala Flag Fair is held in late February annually. It is one of the most important annual festivities for the people of Iguala. It is celebrated with a parade of floats, cockfights, and Mexican handcrafts and folk art exhibitions. Iguala's local artisans create gold and silver jewelry. Wikimedia Commons has media related to Iguala de la Independencia. ^ The Guardian: Mass grave found in Mexican town Archived 2014-10-12 at the Wayback Machine; 5 October 2014. ^ The Washington Post: "Mass kidnapping of students in Iguala, Mexico, brings outrage and protests" Archived 2015-06-27 at the Wayback Machine; 11 October 2014; accessed 10.11.2014. ^ Borderlandbeat.com: "Guerreros Unidos narco banners appear" Archived 2014-10-21 at the Wayback Machine; posted October 2014. ^ (in Spanish)—Jornada.unam.mx: Pérez Silva opinion Archived 2014-10-28 at the Wayback Machine; 6 October 2014. ^ (in Spanish)—SinEmbargo.mx: Martínez opinion Archived 2014-10-07 at the Wayback Machine; 6 October 2014. ^ Elmundo.es: Garcia opinion Archived 2014-10-14 at the Wayback Machine; 5 October 2014. ^ Hernández, Anabel; Fisher, Steve (13 Dec 2014). "Iguala: la historia no oficial". Proceso (in Spanish). Mexico: Proceso. Archived from the original on 2015-01-09. Retrieved 6 Jan 2015. ^ "Iguala, Guerrero, Mexico: Unofficial Story Involves Federal Police and Army in Attack on Ayotzinapa Students". Mexico Voices. 16 Dec 2014. Archived from the original on 2015-01-06. Retrieved 6 Jan 2015. On the night of September 26, Iguala and Cocula police under orders from the mayor of Iguala, attacked the Ayotzinapa normal school students. They killed three and handed over another 43 to Warriors United, the group that allegedly murdered and incinerated them. That's the official version. But an investigative report, based on official documents, videos and testimonies, tells another story: the attack was orchestrated and executed by the Federal Police, with the Army’s complicity or open collaboration. ^ The Guardian: "Mexican gang suspected of killing 43 students admits to mass murder" Archived 2014-11-10 at the Wayback Machine; 7 November 2014; accessed 10 November 2014. ^ NPR: "Mexican Authorities: Drug Traffickers Confess To Killing 43 Students" Archived 2015-04-29 at the Wayback Machine; 8 November 2014; accessed 11.11.2014. ^ Los Angeles Times: Mexico governor steps down over missing students" Archived 2014-10-24 at the Wayback Machine; 23 October 2014; accessed 11.11.2014. ^ 21, Diario. "Diario 21 - El Periodico Plural del Estado - Principal". www.diario21.com.mx. Archived from the original on 29 January 2018. Retrieved 26 April 2018. ^ a b 21, Diario. "Diario 21 - El Periodico Plural del Estado - Principal". www.diario21.com. Archived from the original on 28 January 2018. Retrieved 26 April 2018. ^ 21, Diario. "Diario 21 - El Periodico Plural del Estado - Principal". www.diario21.com. Archived from the original on 9 January 2018. Retrieved 26 April 2018. This page was last edited on 22 November 2018, at 20:18 (UTC).